These coils will lead to an experience that you may have only dreamed about as they allow you to go on a vape trip like no other. The TFV12 Prince X2 Cobra Replacement Coil is created by Smok and many people are quickly trying to get their hands on it. 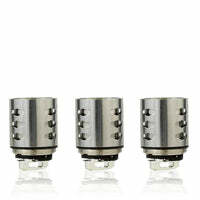 Of course, only the individuals who carry the Prince TFV12 Cobra Edition Sub-ohm Tank by Smok are flocking to it. These coils have a clapton design which is the best part because this allows them to produce some of the biggest clouds you may have ever seen. It might even make you look like you are some kind of fog machine. This coil will also allow you to savor more of flavor that you vape juice has to offer. You might notice a couple of notes you did not recognize in the past. The coil is going to have a resistance of 0.4ohm, which lets them take on a wattage intake range of 40W to 80W. Your current coil may have burned out, and that is the reason why you may be looking into this one. However, they last a long time so that you do not have to constantly keep ordering new ones anytime soon.